THIS ARTICLE HAS BEEN COPIED WITH THE KIND PERMISSION, FROM THE BLACK COUNTRY BUGLE. For 86 yr old Barry Freeman of Stourport on Severn. 18th march, 2011, marked the end of the final Chapter in the history of the Worcestershire Regiment, the regiment he proudly served with in the Second World War. On that day, the last day of the Norton Barracks still occupied closed, bringing to an end 133yrs that the Worcesters have been there. In 1872 the War Department purchased 20.5 acres of land less than a mile to the city boundary. Construction of the barracks began in December 1874, and was completed by May 1877. In November 1877 the 36th ( Herefordshire ) Regiment moved into their portion of the barracks and a month later the 29th ( Worcestershire ) Regiment occupied theirs. These two regiments of foot were amalgamated in the army reforms of 1881 into the Worcestershire Regiment. Norton barracks remained the spiritual home of the Worcesters, even after the Regiment was amalgamated with the Sherwood foresters in 1970. In 1987 the barracks were closed and the site sold for property development. The majority of the complex was demolished and new housing built, with the street names commemorating the history of the Worcestershire Regiment, such as Salamanca Drive, Kohima Drive and Gallipoli Drive. The famous `Keep` was listed, so saved from demolition and was converted to apartments, while the cricket and sports fields were taken over by the Worcester Norton Sports Club, which uses the old Depot Sergeants Mess as its clubhouse. With the completion of the re development in the 1990`s the only part of the former Norton Barracks still occupied by the old Worcestershire Regiment was a one story brick building put up in 1940. This was home to the Worcestershire Regiment Archive, however this closed in March 2011 and the archive moved to the new territorial Army HQ in Worcester. For many years Barry Freeman used the archives at Norton Barracks, searching through the thousands of documents and photographs on behalf of former comrades; he also volunteered to sort through some 2,500ft of cine film held by the archive. Barry was born in Netherton in 1924 but at the age of two his family moved to Hagley and he lived there for the most of his life. Barry was working as a plumber`s mate when he was called up on the 1st of April, 1943, and joined the 1st Battalion Worcestershire Regiment. He spent the next year training for the Allied invasion of Europe, but when d Day came he found himself separated from his Regiment. Barry was among many troops that were held back to form holding units for potential reinforcements but for reasons unknown to Barry, he found himself placed with a unit of Canadians. Barry landed with the Canadians on `Juno` beach on 8th June, 1944, driving a half tracked personnel carrier up the beach. On the 16th June, the 1st battalion Worcestershire Regiment began their departure from England but were delayed by bad weather, they did not land in Normandy until 22nd June. The battalion first went into action on the 27th June, 1944, at Cheux. In the meantime Barry had been fighting with his Canadian comrades but when he found his own Battalion was nearby he was tempted to go and join them. Barry said, “We were on one side of the Carpiquet Aerodrome and I knew the Worcesters were on the other, and I did think about leaving the Canadians and going back to the Worcesters, but I was only 19 at the time and you do what you are told, so I stayed with the Canadians”. Barry witnessed the destruction of the German Seventh and Fifth Panzer Armies in the Falaise Pocket in August, 1944. “ I remember going up on a ridge early one morning and in the far distance I could just make out the flashes of the American guns as they rained down on the Germans”. 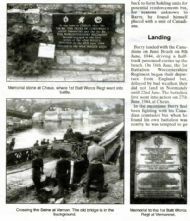 The 1st Battalion the Worcestershire Regiment was part of the 43RD ( Wessex ) Infantry Division and the men of the Worcesters were the first to cross the River Siene at Vernon / Vernonet, 25th / 26th August, 1944. In 2000 Barry joined a group of veterans at the laying of a memorial, mounted on stone from the Malvern Hills, at Vernonet, to those that fell in the battle. Barry fought his way across Northern France, Belgium, Holland and into Germany. A spell of illness at the end of the war saw Barry in hospital and on his discharge from hospital was put on light duties, he has a photograph of himself guarding the entrance to the Panzer barracks in Hamm, Germany, on the 15th July, 1945. Barry was de-mobbed in 1946 and returned to Hagley. For many years the 1st Battalion The Worcestershire Regiment NW Europe 1944-45 group, has arranged annual re-unions for those who served in the Normandy campaign. This year on the 14th May, the last ever re-union was held at the Gainsborough Hotel Kidderminster, and around twenty members are expected to attend. However, the memory of the Worcestershire Regiment is not about to fade. Thanks to the work of Colonel Jock Bannister, Louis Scully and Angela Arthur, among others, the proud history and traditions of the Regiment have been preserved. For a number of years Angela was the office manager of the regimental Archives at Norton Barracks. “ she`s worth her weight in gold,” said Barry. Colonel Bannister leads the NW Europe re-union group, while Louis Scully maintains a highly detailed and authoritative website on the history of the Worcestershire Regiment. The lineage of the Worcestershire Regiment can still be traced today. 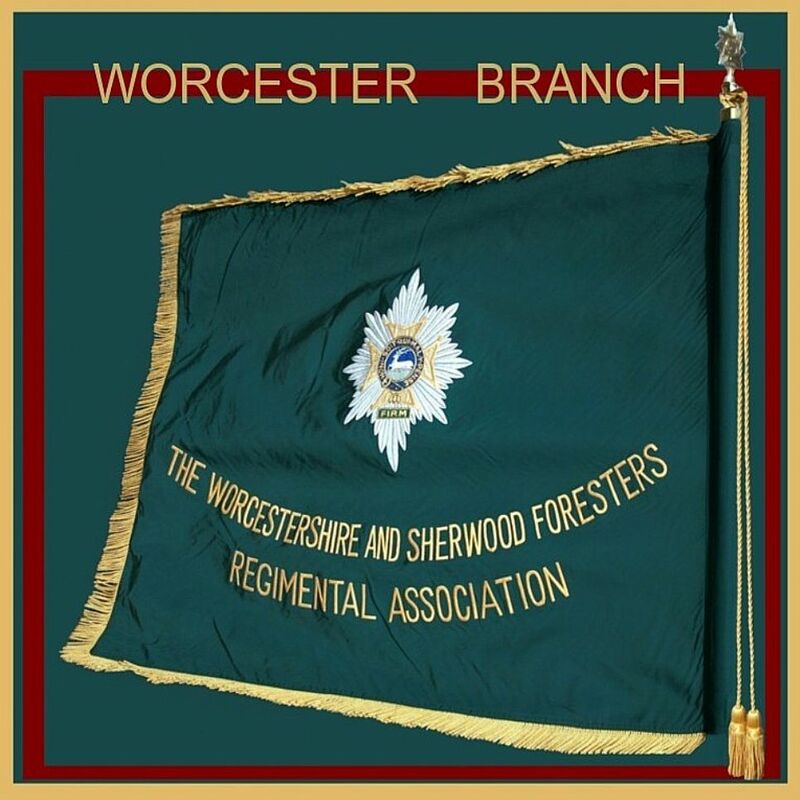 In 1970 it merged with the Sherwood Foresters ( made up of the Nottinghamshire and Derbyshire regiments ) to form The Worcestershire and Sherwood Foresters regiment ( 29th / 45th Foot ). Further re-structuring in 2007 saw this regiment combine with the Cheshire Regiment and the Staffordshire regiments to form the new Mercian Regiment.